Learn what makes narcissists and psychopaths tick and tips and advice on how to cope with them! Your copy signed and dedicated by the author Sam Vaknin (from Amazon, delivery worldwide) - click only on this link! An electronic book (e-book) is a computer file. It is sent to you attached to an e-mail message. Save the attachment to your computer’s hard disk, or on your smartphone, Kindle, or NOOK devices and click on it to open the e-book and read it. Click HERE to Purchase “A to Z of Narcissism and Narcissistic Personality Disorder Encyclopedia: The Narcissism Bible”: Almost 1000 pages of A to Z entries: the first comprehensive encyclopedia of pathological narcissism and Narcissistic Personality Disorder in clinical and non-clinical settings: family, workplace, church, community, law enforcement and judiciary, and politics. Save $63! Click HERE to Buy: SERIES of 16 e-books (5000+ pages, including the full text of "Malignant Self-love: Narcissism Revisited") for the price of 1 print book! The FULL TEXT of Sam Vaknin's classic, groundbreaking BIBLE of NARCISSISM and NARCISSISTIC ABUSE, now in its 9th edition. Tips and advice as well as the most complete clinical background. Narcissistic Personality Disorder and its effects on the narcissist, the psychopath and their nearest and dearest - in 100 frequently asked questions and two essays - a total of 680 pages! Updated to reflect the NEW criteria in the recent fifth edition of the Diagnostic and Statistical Manual (DSM). How to identify abuse, cope with it, survive it, and deal with your abuser. How to identify narcissistic and psychopathic bullies (colleagues, bosses, suppliers, authority figures) in the workplace and how to cope with them. Self-assessment questionnaires, tips, and tests for victims of abusers, batterers, and stalkers in various types of relationships. Hundreds of excerpts from the archives of the Narcissistic Abuse Study List regarding Pathological Narcissism, relationships with abusive narcissists and psychopaths, and Narcissistic Personality Disorder (NPD). Dozens of Frequently Asked Questions regarding Pathological Narcissism, relationships with abusive narcissists and psychopaths, and Narcissistic Personality Disorder (NPD). The anatomy of a mental illness (Narcissistic Personality Disorder): its origins, its unfolding, its outcomes. Psychodynamic study of pathological narcissism, relationships with abusive narcissists and psychopaths, and the Narcissistic Personality Disorder, using a new vocabulary. Can narcissists and psychopaths be cured? Can their behaviour be modified? How are these mental health disorders diagnosed? Borderline, Narcissistic, Antisocial-Psychopathic, Histrionic, Paranoid, Obsessive-Compulsive, Schizoid, Schizotypal, Masochistic, Sadistic, Depressive, Negativistic-Passive-Aggressive, Dependent, and other Personality Disorders. How to Divorce a Narcissist or a Psychopath – Click HERE to Buy! Divorcing a narcissist or a psychopath is no easy or dangerless task. This book is no substitute for legal aid, though it does provide copious advice on anything from hiring an attorney, to domestic violence shelters, planning your getaway, involving the police, and obtaining restraining orders. Issues from court-mandated evaluation to custody are elaborated upon. The book describes the psychology of psychopathic narcissists, paranoids, bullies and stalkers and guides you through dozens of coping strategies and techniques, especially if you have shared children. How to Cope with Narcissistic and Psychopathic Abusers and Stalkers – Click HERE to Buy! How to cope with stalkers, bullies, narcissists, psychopaths, and other abusers in the family, community, and workplace. How to navigate a system, which is often hostile to the victim: the courts, law enforcement (police), psychotherapists, evaluators, and social or welfare services. Tips, advice, and information. Purchase 3 DVDs with 16 hours of video lectures on narcissists, psychopaths, and abuse in relationships – click HERE! Save 73$! Purchase 3 DVDs (16 hours of video lectures) + The Narcissism, Psychopathy, and Abuse in Relationships Series of SIXTEEN e-BOOKS – click HERE! Purchase 3 DVDs (16 hours of video lectures) + Malignant Self-love: Narcissism Revisited (ninth print edition) – click HERE! Buy TWO PRODUCTS and Get a FREE 30-minute chat with Sam Vaknin! Click HERE! Buy TWO PRODUCTS and Get the THIRD ONE FREE! Click HERE! 1. Is my personal information kept private and secure? Your personal details, credit card and PayPal data are absolutely secure with CCNow’s Secure Server - they are not accessible by anyone and will not be forwarded to any third party! 2. Why should I buy your products? How can they – and you - help me? My print book, e-books, and video lectures deal with Narcissism, Narcissistic Personality Disorder (NPD), the Psychopathic Narcissist, And Relationships with Abusive Narcissists and Psychopaths. Are YOU Abused? Stalked? Harassed? Victimized? Confused and Frightened? Had a Narcissistic or Psychopathic Parent? Married to a Narcissist or a Psychopath - or Divorcing One? Afraid your children will turn out to be the same? Want to cope with this pernicious, baffling condition? OR Are You a Narcissist or a Psychopath - or suspect that You may be one? My book, ebooks, and video lectures will teach you how to Cope, Survive, and Protect Your Loved Ones! I am also available for a one-on-one consultation via e-mail, phone, or video chat. 3. What are your credentials? Why should I trust your information? You can learn more about me and my work here, here, and here. In a nutshell, "Malignant Self-love: Narcissism Revisited" as well as my ebooks and video lectures are based on correspondence since 1996 with hundreds of people suffering from Narcissistic Personality Disorder (narcissists) and with thousands of their suffering family members, friends, therapists, and colleagues. I am not a mental health practitioner, though. 4. What comprises the Bonus Pack? When you purchase the print book or the Narcissism Series of 16 ebooks directly from the publisher you also get a Bonus Pack as a token of our gratitude for your trust and business. The Bonus Pack is an e-mail message that includes links to thousands of additional pages and documents about narcissists, psychopaths, and abuse: a dozen e-books, new FAQs, a comprehensive bibliography, chat transcripts, interviews, journal entries, excerpts from the archives of the narcissism lists, and dozens of essays and appendices. 5. What’s in the 9th Edition of “Malignant Self-love: Narcissism Revisited”? 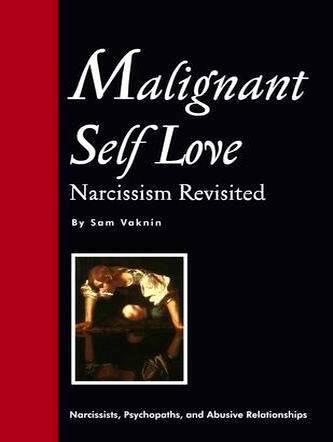 Read Sample Chapters of "Malignant Self-love: Narcissism Revisited" - Click HERE! and HERE! Download the sample chapters and give them away on your OWN WEB SITE! 6. What do scholars, the media, and readers of your book have to say? "Sam Vaknin is the world’s leading expert on narcissism." "Vaknin’s a respected expert on malignant narcissists ... He set about to know everything there is about the psychopathic narcissist." “Among many books published on the topic of pathological narcissism, this is by far the best. "Sam is doing a great work on pathological narcissism. His book "Malignant self love" is our first guideline in handling malignant types of patients in the forensic setting." “The book penetrates deeply into the narissist's mind and is filled with myriad gripping novel insights. “Brilliant, insightful, extremely relevant, not only clinically, but practically, on a day to day basis. “Sam Vaknin is extremely impressive and the author of Malignant Self-Love: Narcissism Revisited, which is a seminal work on narcissism. 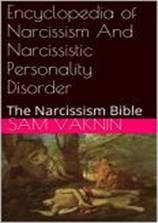 "Sam Vaknin's book is THE bible on Narcissism!" "There is no more important work than this one on the subject ... You may very well discover yourself." "Read Malignant Self Love so you will understand that you are NOT crazy, you are just embedded in a crazy making relationship." "Vaknin's depth and breadth are unmatched anywhere else and by anyone else. He knows everything there is to know about narcissistic and psychopathic abusers and how to cope with them effectively." "I was stimulated just as I was challenged and enlightened." "The only source of such vast, serious, elaborated and thorough first-hand information about Narcissism available. Useful for victims as well as therapists." with deep insight into the numerous expressions of this devastating and often insidious disorder." "One powerful healing tool in our therapy with these people is Dr. Vaknin's book. The most accurate portrayal of the 'typical' cult leader we have ever seen." "A must read for psychologists, social workers, and all individuals who want to learn how to deal with the narcissists in their lives." "Required reading for any codependent - to understand how the other side works." "If you wish to get under the skin of a Narcissist, if you wish to get to know how he thinks and feels and why he behaves as he does, then this is the book for you." "Sam Vaknin is a leading authority on the topic of narcissism." "I cannot recommend this book enough to those of you who have this disorder, to families and friends who are trying to understand." "(T)his book is a must read and will give you insight into the emotionally destructive people in your workplace, your family and among your friends. "...This book has an important purpose. I am sure it will be appreciated in a library, classroom or among the mental health profession." "Now, for the first time, a much-needed first hand account of what Narcissistic Personality Disorder is like. Offers insight and clarity." 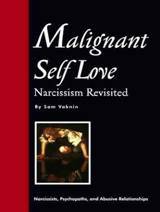 “Sam Vaknin's study of narcissism is truly insightful. The author has done probably more than anyone else to educate others to this poorly understood condition. Sam has plugged all the loopholes, exposed all the plots, and introduced a new language to confront the Narcissist. A 'hands-on' tool that can immediately bring relief. if you NEED a change, then Malignant Self Love can give you your life back. This book is a lifesaver! FIVE STAR rating at Barnes and Noble - Read what more than 200 readers have to say - Click HERE! 7. Is there any way I can contact you or your publisher?